Despite all the reasons homeowners should invest in a residential solar system, they still have to be sold. Homeowners know that solar power is clean and renewable, is getting cheaper to build every year, and that installing a solar system can save them a fortune in electricity bills. However, many still need to be convinced that a solar system is a smart addition to their home. Return on Investment – Unlike many home improvements, a residential solar system will pay for itself. How long it will take for a solar system to pay for itself depends on various factors, such as size of the home, power consumption, and location. It also depends on the cost of the system, the cost of the power generated, and the cost of power in the region. However, the solar system will pay for itself over time, typically within 6 to 10 years, especially if you take additional steps to protect the investment, such as installing a protective barrier to keep critters and environmental damage from affecting the solar system safety and longevity. Tax Benefits – The federal Solar Investment Tax Credit (SITC) is still available and homeowners can take 30 percent of the cost of the solar system off their taxes through 2019. The credit drops to 26 percent in 2020 and 22 percent in 2021, and will be eliminated altogether starting in 2022. Clearly, now is the time to buy a residential solar system. In addition to the federal SITC, there are state tax credits which bring even greater savings. Depending on the state, a sales representative can present solar tax incentives that will substantially shorten ROI timelines. Appearance – One of the greatest objections to installing rooftop solar systems is their appearance. 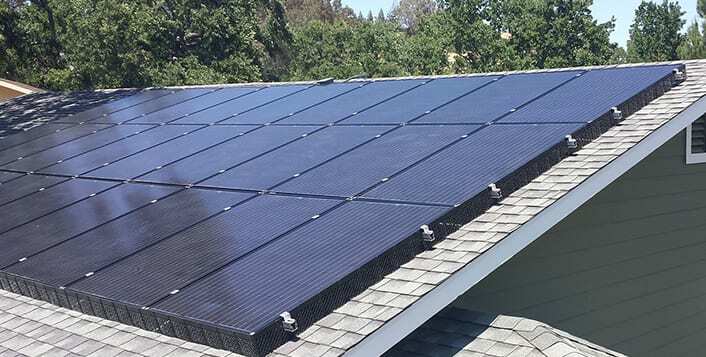 Homeowners may see solar systems as unattractive; they don’t like the look of the solar modules on their roof, especially when seen from the street. To address that problem, and to help improve the solar installer’s bottom line, we have developed the SolaTrim protective barrier. We designed SolaTrim to be both attractive and effective, made from all-weather aluminum and stamped with a diamond pattern to promote airflow while keeping out pests and debris. By including the black SolaTrim skirting in your solar system bid, you can improve the aesthetics with an attractive finish, and increase the longevity and safety of the solar system by keeping out animals that may nest underneath or chew the electrical wiring. SolaTrim will also prevent debris from accumulating underneath the array enabling moisture buildup that can result in roof rot. Solar integrators will increase profit margins at the same time by eliminating unnecessary repair jobs caused by these threats. Happy Customer References – Your best sales tool is a happy customer. The more positive referrals you can get, the more customers it generates. Once certain a customer is satisfied, Installers will want to be sure to ask for a reference when the job is completed. Posting positive customer comments on your business’ social media pages in critical. These days the first thing consumers do when checking out a vendor is look at Yelp!, Facebook, Pinterest, and other social media sites. Positive feedback can build sales momentum and businesses are taking advantage of it. The best way we know to ensure happy customers is to set the right expectations at the outset. Being clear about the savings in power usage and the benefit of tax incentives is important to homeowners who may not be familiar with these subjects; be realistic in your projections, even a little conservative. It’s always good business to under-promise and over-deliver. Solar Contractors will want to deliver a clean, high-quality installation, including finishing touches such as attractive protective skirting to hide the solar racking and cables. Our survey customers tell us they have a much higher satisfaction rate with solar systems equipped with SolaTrim barriers. They love the idea of protecting their investment and are impressed with the sleek, finished look that SolaTrim gives to any solar system. Bring pictures from previous installations to show prospects how attractive a finished solar array can look. While residential solar power systems may not sell themselves, the right information can be presented to make closing the deal a little easier. Armed with the right facts, realistic projections about ROI and good advice on how to make the system last, a solar rep can make the value of a purchased or leased system more tangible. Reassuring prospects about the aesthetic appeal from a properly installed solar system can overcome this objection as well. After all, homeowners aren’t just looking to save money but to improve the value and curb appeal of their home as well.